Deploying the Lawo mc²36 console for the Ravenna Festival helped simplify the sound setup over that of previous years. Italy’s annual Ravenna Festival attracts classical music lovers from around the world. As in years past, festival producers chose Soundscape immersive live audio technology from d&b audiotechnik paired with mixing systems from Lawo. 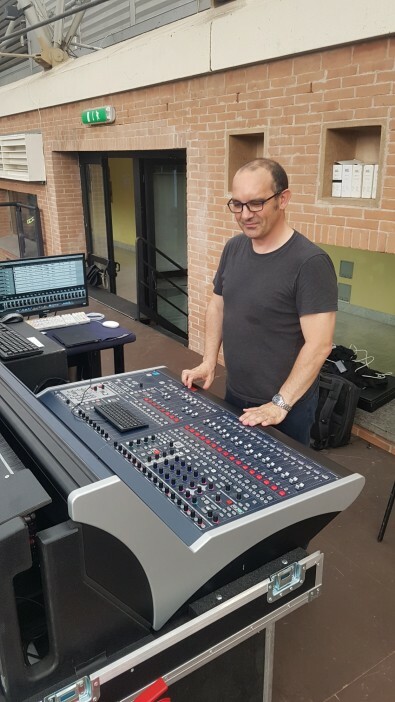 BH Audio’s Massimo Carli was in charge of the Ravenna Festival system setup and he chose Lawo’s IP audio capable mc²36 console for FOH mixing, having previously proved its adaptability at a Verdi Festival staged at the Farnese Theater in Parma. Carli said the producers wanted multitrack recordings to be made, so they used dual recording systems connected to the console through RAVENNA audio networking technology. “I was also asked to add all the intercom and dressing room calls for the singers and choir, which was possible using only the desk’s channels and internal matrix,” he said. “One day immediately before the general rehearsal, I was asked to send sound to all the rooms in the theater. The mc²36 made it possible to meet all the requests without problems. BH Audio’s Massimo Carli chose Lawo’s IP audio capable mc²36 console for FOH mixing. “The use of RAVENNA/AES67 makes the setup very clean compared to the past,” Carli said. “From the mc²36, I can send 44 direct outs and 20 post-fader auxes to the Soundscape DS100 processor via one of its three AES67 ports. And I send the DS100 outputs to the AES/EBU outputs of the Lawo Stagebox directly to the various loudspeakers. We also used a tracking system through the network to dynamically transmit the correct position of the singers to the DS100. Deploying the Lawo mc²36 console for the festival helped simplify the sound setup over that of previous years, as it required only the console and a Lawo Compact I/O Stagebox in addition to the d&b DS100, connected with Cisco switches. Previously, it had required an analog console with AES/EBU A/D converters, a format converter, an audio matrix delivering an AES/EBU output to the amplifiers.